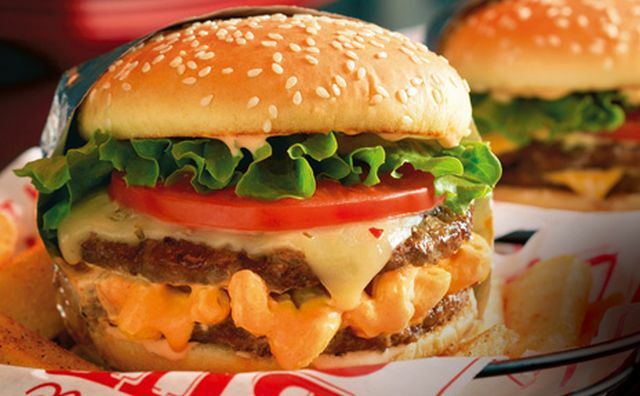 Red Robin expands their (relatively) value-priced Red's Tavern Menu with a trio of new cheesy items including a new mac & cheese burger. - Buzz Mac 'n' Cheese Tavern Double - Two seasoned, flame-grilled patties with creamy Buzz Mac 'n' Cheese (four-cheese macaroni with spicy Buzz sauce), pepper jack cheese, and spicy Buzz Ranch sauce on a sesame seed bun with Bottomless Steak Fries on the side. You can also just order the mac & cheese by itself in a larger portion. - Four Cheese Melt - Swiss, Provolone, Cheddar, and Parmesan melted between two slices of Parmesan and Cheddar cheese-crusted bread with Bottomless Steak Fries on the side. - Tavern Mac 'n' Cheese - A half-pound bowl of pasta coated in a creamy five-cheese sauce, topped with toasted crouton crumbs, Parmesan cheese, and fresh parsley. Served with a side salad.